Wishing all my blog readers some sweetness on this solstice day! Here in the northern hemisphere, this longest day of the year heralds bountiful summer fruits and vegetables: apricots, cherries, squashes, tomatoes, peppers, and basil will all be coming into season soon, at least in California. What other summer crops will you be harvesting? And today our southern hemisphere friends are beginning their winter. I would love to hear about local harvests from my readers in Australia, South Africa, Argentina, and other southern locations. I’d also love to hear from those close to the equator, in Malaysia, India, the Philippines, Hawaii--what are your local harvests on this solstice? In California, strawberries are red and ripe, and I offer you a solstice recipe for chocolate-dipped strawberries. I usually make dozens of these at a time, but tried to reduce the recipe to family-size. Some recipes use shortening, paraffin, cream, liqueur, etc. to make the chocolate shell thinner. I asked myself if anyone had ever complained about too much chocolate on my strawberries. But since I have heard no complaints, I stuck with my usual plan and used only chocolate. I used a combination of semisweet and milk chocolate bits this time, but you can use whatever kind of chocolate bits you like. Dipping Action: Swirl in Chocolate, Shake off Excess, Twist to Wrap the "Drip"
Chocolate bits are forgiving, but all chocolate will “seize” and become grainy, hard, and tasteless if you (1) heat it too much or (2) splash water into the hot chocolate. (I found this out the hard way in 1990 while trying to construct a chocolate mountain in a sculpture class using a plaster-backed rubber mold—a sad waste!) 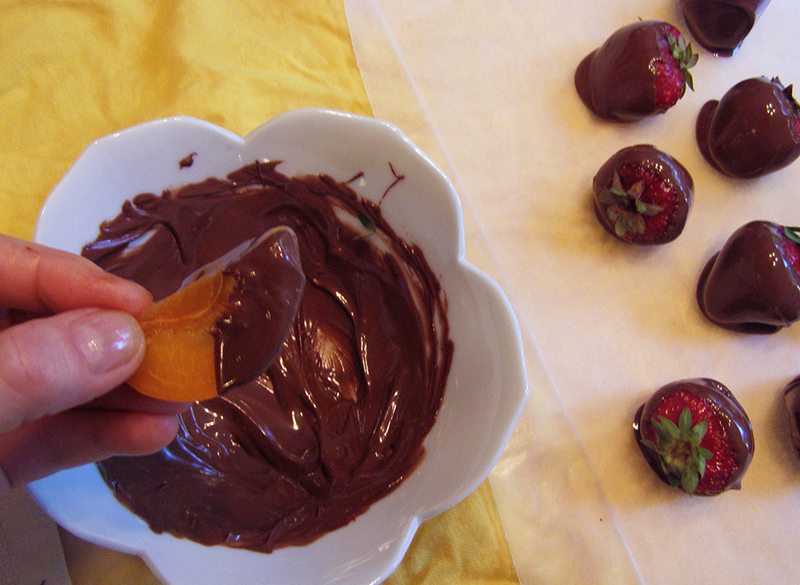 So heat chocolate up slowly and stir it frequently, and dry off your fruit well before dipping. Your fruit should be at room temperature, not chilled from the fridge, or chocolate might not stick. You can also dip a large apricot, sliced into 6 pieces, or other fruit as long as it’s dry. Eat these within about 24 hours of dipping, or they'll start getting watery. 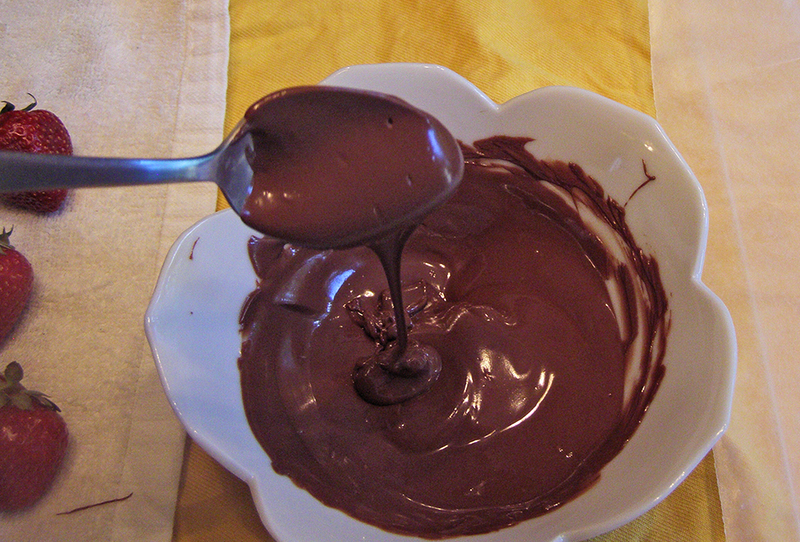 Chocolate Flowing off Spoon in Thin Stream: Ready for Dipping! Prepare fruit beforehand: fruit must be washed, dried, and at room temperature. Cut apricot into 6 wedges and carefully dry edges. Prepare working area beforehand: Cover a cooky sheet, cutting board, or other flat hard surface with waxed paper or parchment. You will need to put this into the refrigerator after fruit is dipped, so use an appropriate size. Set fruit near waxed paper, and leave a space for the chocolate bowl. Set out toothpicks to help dip the fruit if needed. Melt chocolate: Microwave in small bowl with sloping sides. Microwave for 30 seconds, stir, microwave for another 30 seconds and stir again. If chocolate is NOT almost melted, microwave again for 30 seconds…if it IS melted, microwave for 10 seconds and stir again. Continue microwaving for 10 second intervals and stirring until chocolate flows off the spoon in a thin stream with no lumps. I use 10-second intervals (short!) to prevent overheating. Dip fruit: Some people grasp the green stem and leaves to dip the berries, others use toothpicks. I use both. The toothpick provides support so you don't break off the green leaves, and the green stems and leaves make it easier to maneuver the strawberry. Insert toothpick and grasp both toothpick and green leafy stem. Swirl around in chocolate, lift up and shake vertically a couple times to remove excess chocolate, then twist strawberry so chocolate “drip” wraps around strawberry (see photo). Place on waxed paper and repeat process with other strawberries (if you’re careful you can reuse toothpick from first strawberry). 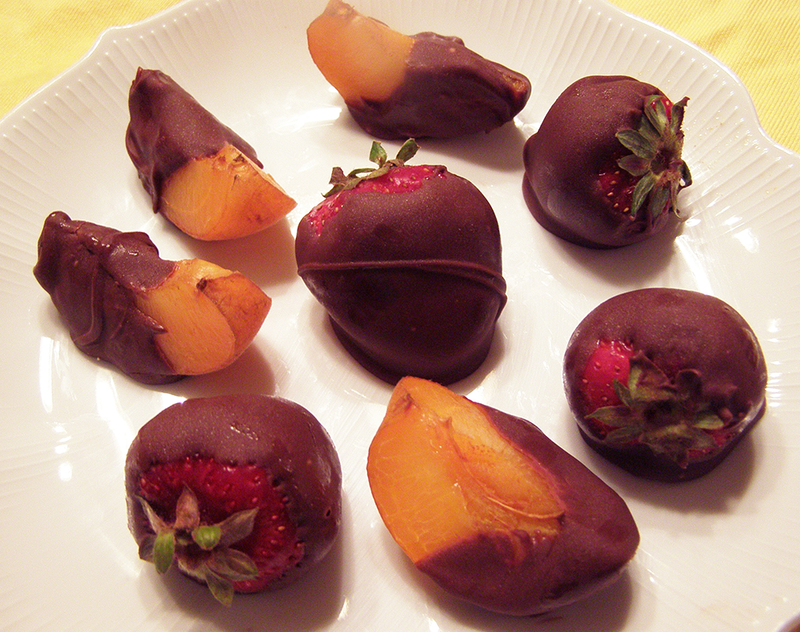 For apricots, hold in fingers and dip halfway into chocolate, or spoon chocolate onto half of apricot. Place on waxed paper. Refrigerate: Put tray with waxed paper into refrigerator until chocolate is set, about 1 hour. For optimum taste, remove from refrigerator and serve at room temperature. It’s true that chocolate-covered strawberries taste best served at room temperature. While this is easy to control at potlucks, it is not so easy at home with the family. It seems that family members want to eat them as soon as the chocolate has set! Again, I have heard no complaints about too-cold dipped strawberries.